OK, THIS ISN'T RUNNING, BUT IT'S A HECK OF A FISH STORY! 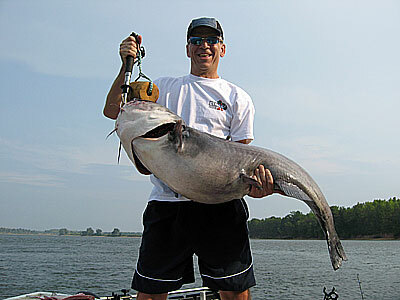 Here is another story about "grappling" catfish. Late in August, after trying to find a suitable date for nearly two years, Stuart and I were finally able to hook up with super catfish guide, Phil King. Don't let the fact that Phil is "local" fool you. He's probably the best catfishing guide in the U.S. We made a late afternoon fishing excursion to the Tennessee River and immediately set out fishing....which is to say, doing EXACTLY what Phil told us to do. We had not fished more than 45 minutes when Stuart's rod was slammed by a monster. 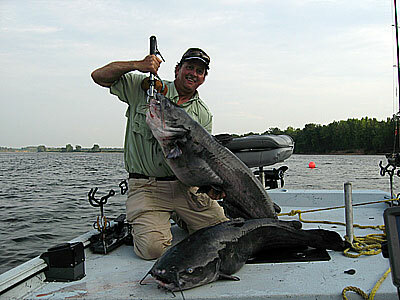 After 10 minutes, Stuart boated a 58 pound catfish! We were all very excited, including Phil. 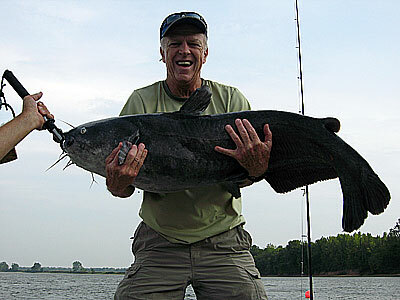 Phil told us that this fish would be the second largest catfish he'd ever seen come out of the Tennessee. We were still basking in the glory of Stuart's monster when my rod, baited with maybe a pound of cut bait, quivered then bent nearly in half. Following Phil's instructions I began a fight with an underwater creature which, to me, seemed as intense as Stuart's. A first it seemed it was a relatively small fish as I reeled and he came toward the boat. Soon, he decided he didn't like the way things were going and headed away from the boat. My arms and back soon were able to testify that this was no small fish. Ten minutes later, Phil had the dolphin-sized fish in his giant dip net. When we got him on board, the scales showed he weighed 52 pounds. Phil was quick to say that this 52-pounder was the 3rd largest catfish he'd ever seen come from the Tennessee. Within an hour we had done the impossible; boated two fish weighing 110 pounds! These two fish ranked as the 2nd and 3rd largest fish Phil King had seen come from the Tennessee River in 30 years of fishing. There is pictorial proof below! Oh yes, we released the giants so they could continue to grow!